SFI Leader Sudipta Gupta profile, family, address, education, SFI Leader Sudipta Gupta died in Kolkata, 4th April 2013 Kolkata strike. 23-years old Sudipta Gupta, SFI Leader, died in police custody at SSKM Hospital (Kolkata) around 6:20pm today on 2nd April 2013. At first let's check out who is Sudipta Gupta and educational background, family details of Sudipta Gupta. • House Address of Sudipta Gupta: - 'Sargam House', Srinagar Main Road, 'Gomkol' area, New Garia, South Kolkata. • Educational qualification of Sudipta Gupta: - He was the student of Nabakrisna Pal High School and later admitted to Netajinagar College. After completion of his graduation from Netaji Nagar College he joined Rabindra Bharati University (RBU) to complete his Post Graduation. He is an MA in Political Science 2nd year student. • Political background of Sudipta Gupta: - He is an active SFI leader. • Reason of Sudipta Gupta's Death: - Dr. T.K. Ghosh, Super of SSKM Hospital, stated that SFI Leader Comrade Sudipta Gupta died because of Polytrauma with severe injury on right side of forehead. The incident took place near Dharmtala (Kolkata) on Rani Rashmoni Avenue where hundreds of SFI Supporters gathered in the pre-scheduled Protest Rally with the demand of College Union Elections in the West Bengal state. During this pre-scheduled Law Violation protest rally demanding Students Union Poll; Police arrested several SFI activists and send them to Presidency Jail Lock-up by bus from which Sudipta Gupta accidentally fall down [as per police]. But, SFI supporters who were there in the bus and eye-witnesses claims Police hit badly (lathi charge) & pulled off from bus for which severe injury happened. Javed Shamim, Joint Police Commissioner, claims that SFI Leader Sudipta Gupta died at SSKM Hospital (Kolkata) because of his injury sustained in an accident while he & 30 other SFI supporters were being taken in a bus to Presidency Jail Lock-up after being arrested. Sudipta Gupta accidentally fell from the bus & got injured. Joint Commissioner of Police Javed Shamim said there was no Lathi-charge by the police. It means, the whole incident is an accident as per police. CPIM & SFI party alleged that comrade Sudipta Gupta succumbed to injuries sustained in lathi-charge by police. They also alleged that if an accident (as per police that he got hit with a lamp post) would have happened then why 7 more supporters also got injured badly. Another SFI activist is still fighting with life at Medical College and he requires plastic surgery to recover. Party leaders claims after arrest and in police custody; it's the responsibility of police to give every security & medical treatment to all. Eye witnesses & SFI supporters also claims that Police didn't help them to shift injured Sudipta to hospital. It was the negligence of policemen. 3rd April 2013 (Wednesday), SFI Supporters along with CPIM party leaders will attend the rally with comrade Sudipta Gupta's dead body in Kolkata. CPIM & SFI party has declared that 12-Hours Strike will take place at Garia & Tollygunje areas of Kolkata on 4th April 2013 (Thursday). 2013 Election Poll Rejinagar vote result, Nalhati vote result, English Bazar vote result 2013, TMC Congress CPIM BJP party candidate names of Rejinagar, Nalhati & English Bazar By-poll election 2013. The By-Poll (Vote) of three assembly constituencies of West Bengal [Rejinagar, Nalhati & English Bazar] is on 23rd February 2013 as per the announcement of Election Commission of India on Legislative Assembly By Election 2013. Total of three Assembly By Election of West Bengal are happening in West Bengal in 2013. These three assembly constituencies (Rejinagar, Nalhati & English Bazar) By-polls is scheduled on on 23rd February 2013 (Saturday). The Election (Vote) at Rejinagar & English Bazar happened because of sitting Congress candidates of Rejinagar & English Bazar left Congress Party & joined Trinamool Congress. On the other hand, Nalhati seat left vacant after Congress leader Abhijit Mukherjee won Jangipur Parliamentary election last year. All of these constituencies are won by Congress party previously. Sekh Humayun Kabir candidate name for Rejinagar By Election of Trinamool Congress Party (TMC). Arabinda Biswas candidate name for Rejinagar By Election of BJP Party. Rabiul Alam Chowdhury candidate name for Rejinagar By Election of Congress party. Sirajul Islam Mandal candidate name for Rejinagar By Election of RSP (CPIM Left) party. Seikh Nurmohammad candidate name for Rejinagar By Election of AIUDF party. Humayun Kabir candidate name for Rejinagar By Election of Independent party. Sirajul SK candidate name for Rejinagar By Election of Independent. Md Sirajul Islam Mondal candidate name for Rejinagar By Election of Independent. Kazi Rabiul Islam candidate name for Rejinagar By Election of Independent. Sekh Jiyaur Rahaman candidate name for Rejinagar By Election of IUML. Reason for 2013 By Election of Rejinagar seat of Murshidabad - Congress MLA Humayun Kabir left congress party and joined Trinamool Congress (TMC) party. Thus the seat of Rejinagar of Murshidabad left vacant. Biplab Ojha candidate name for Nalhati By Election Trinamul Congress (TMC) party. Dipak Chatterjee candidate name for Nalhati By Election All India Forward Block (Left - CPIM) party. Abdur Rahaman (Liton) candidate name for Nalhati By Election Congress party. Anil Singha candidate name for Nalhati By Election BJP party. Nurul Islam candidate name for Nalhati By Election JP party. Md Noorul Hoda candidate name for Nalhati By Election AIUDF party. Dhananjoy Bandopadhyay candidate name for Nalhati By Election Independent. Kaosar Sekh candidate name for Nalhati By Election Independent party. Reason for 2013 By Election of Nalhati seat of Birbhum - Congress MLA Abhijit Mukherjee contested from Jangipur Seat last year because that seat left vacant when Shri Pranab Mukherjee became Indian President. Abhijit Mukherjee had won from Jangipur seat and became MP. So, the seat of Nalhati left vacant. Koushik Misra candidate name for English Bazar By Election CPI(M) [Left] party. Krishnendu Narayan Chowdhury candidate name for English Bazar Trinamool Congress (TMC) party. Narendra Nath Tiwari (Nandu Tiwari) candidate name for English Bazar Congress party. Sanjit Mishra candidate name for English Bazar BJP party. Satish Rajbanshi candidate name for English Bazar Independent party. Md Anisur Rahaman candidate name for English Bazar AIUDF party. Reason for 2013 By Election of English Bazar seat of Malda - Congress MLA Krishnendu Narayan Chowdhury of English Bazar left congress party and joined Trinamool Congress (TMC) party. Thus the English Bazaar seat left vacant. The By Election in West Bengal took place on 23rd February 2013 (Saturday) at Rejinagar, Nalhati & English Bazar constituency. The vote (By-poll / Upa Nirvachan / By Election) happened on 23rd February 2013 (Saturday) and the results of By Election of these three constituencies are going to be declared on 28th February 2013 (Thursday). The counting of votes for announcing the results of Rejinagar, Nalhati & English Bazar vote is on next Thursday i.e., 28th February 2013, 8am onwards. Result of Nalhati By Election (Vote) 2013 - will be updated soon. Result of 2013 Rejinagar By Election (Vote) - will be updated soon. Result of 2013 English Bazar By Election (Vote) - will be updated soon. 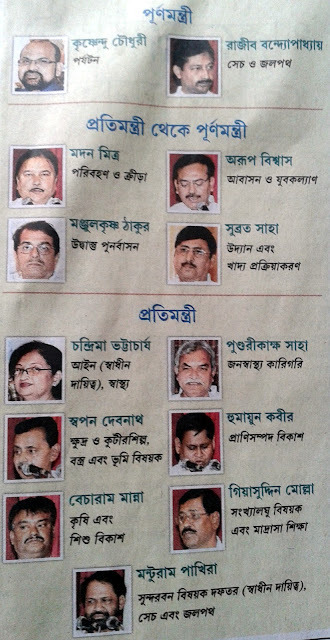 Total of eight Trinamool Congress leaders included in West Bengal State Cabinet on 21st November 2012 (Wednesday). Few changes have been made in the Ministry of West Bengal Government by introducing eight new faces and changing department of some existing ministers. The 'Oath Taking Ceremony' was done at Raj Bhawan in the presence of West Bengal Governor Shri M. K. Narayanan, West Bengal Chief Minister Ms. Mamata Banerjee and other Ministers of West Bengal State. Here are the W.B. State Government Minister names, few of them promoted with full-rights, few of them received additional responsibilities and few of them shifted to other department. Manjul Krishna Thakur, TMC leader from Thakurnagar (North 24-Parganas). Tourism Minister of W.B. Rachpal Singh shifted to ‘Parikalpana’ department from ‘Tourism’ department. Malay Ghatak shifted from Law & Judicial Affairs Ministry to Agricultural Department. Chandrima Bhattacharjee received the responsibility of Law Ministry along with Health Ministry. Chandranath Singh became Fishery Minister of WB State. Rabindranath Bhattacharjee shifted to ‘Parisankhyan’ department from ‘Agricultural Ministry’. Madan Mitra, Arup Biswas, Subrata Saha & Manjul Krishna Thakur was given responsibility of ‘Purna-Mantri’. Ujjwal Biswas shifted to ‘Karigori Shiksha’ from ‘Food Processing’ ministry. Pundarikakho Saha, TMC leader of Nadia district. Rajib Bandopadhyay, TMC leader of Domjur (Howrah). Manturan Pakhira, TMC leader of Kakdwip (South 24-Pgs). Giasuddin Molla, TMC leader of Magrahat (South 24-Parganas). Becharam Manna, TMC leader from Singur (Hooghly). Humayun Kabir, TMC leader of Rejinagar (Murshidabad), recently joined Trinamool Congress party leaving Congress Party. Krishnendu Chowdhury, TMC leader from Maldah district, became Tourism Minister of West Bengal State. Swapan Debnath, TMC leader from Burdwan. Some says, it’s an intelligent move by TMC by introducing new faces in WB Government just before ‘Panchayat Election 2013’ because these eight newly appointed Ministers belongs to different Districts of West Bengal where ‘Panchayat Election’ will be done in 2013. 20th September 2012 [Thursday] Protest against UPA Government’s decision on Diesel price hike, LPG cylinders limitation and FDI in multi-brand retail will took place country-wide. Yes, Bharat Bandh [Strike in India] has been called by the BJP-led NDA along with other major opponent parties of Congress-led UPA Government on 20th September 2012. Left Parties also announced their support towards 20th September 2012 Bharat Bandh and declares 12-Hours All India General Strike on the same issue. Since the Diesel price increased by Rs.5/-, the Private Bus Associations in Kolkata asked Govt. of West Bengal to increase the Private Bus Fare. But, as we know, Chief Minister of West Bengal Mamata Banerjee always against the increment of fare & price hike. This time also, Honourable Chief Minister Mamata Banerjee is against the decision of UPA Government and also not willing to increase Private Bus Fares in Bengal to help the people. This is why; Bus Associations also started their Strike by withdrawing Private Buses from Kolkata from 17th September 2012. On 18th September 2012, All India Trinamool Congress led by Mamata Banerjee will decide what step to be taken against the diesel price hike, cooking gas limitations & allowing FDI. The deadline of 72-hours given to UPA Government by Mamata Banerjee & TMC [alliance party of UPA Government] for the roll-back of their “diesel price hike, cooking gas limitations & allowing FDI” decision will end on 18th September 2012. Comrade Biman Bose, Left Front Chairman of West Bengal, requested people of Bengal to raise their protest against the diesel price hike, cooking gas limitation policy & FDI introduction in retail by joining 12-Hours All India General Strike on 20th September 2012. The Strike of 12-hours [Starting from 6am in the morning] has been announced in West Bengal and also in Tripura. CPI(M) ruling Left Front in Tripura also called for a 12-hours Strike (Bandh) on the same day on same issue. • Reason of 20th September 2012 Strike in India [Bharat Bandh]: - Congress-Led UPA Government has announced few things which would harm the interest of Indian Citizens and this is why opposition parties are going to show their protest through Bharat Bandh (Strike in India) on 20th September 2012. Let’s check out what are those measures announced by UPA Government - Diesel Price Hike by Rs.5/- per Litre, Limiting of subsidised Cooking Gas Cylinders to 6 per year, allowing Foreign Direct Investment (FDI) in multi-brand retail and disinvestment in profit-making Public Sector Undertakings (PSUs). BJP-led NDA, Left Front, DMK & other opposition parties called for General Strike in India [Bharat Bandh] on 20th September 2012. Since, so many parties have jointly called for strike; it would surely ‘Shutdown India on 20th September 2012’. It was nearly 3 hours meeting of Trinamool Congress party leaders happened at Town Hall, Kolkata on 18th September 2012. After the meeting of TMC party leaders, around 8:30pm TMC Founder & Chief Minister of West Bengal Mamata Banerjee withdraws their support from UPA-2 Government. Mamata Banerjee, who always worked for the people, earlier gave 72-hours deadline to UPA-2 Govt. to roll-back their decision. Mamata Banerjee asked for at least 12 LPG cylinders per family per year, FDI introduction shouldn't be done and diesel price shouldn't increase by Rs.5/- to the UPA-2 Government; but Congress-led UPA-2 Government didn’t make any decision within the scheduled time. Thus, today on 18th September 2012 in the evening Mamata Banerjee took a strong step for the people by announcing 'TMC withdrawing their support from UPA-2 Government'. Chief Minister of West Bengal Mamata Banerjee, who took the decision of withdrawing their support from UPA-2 Govt. for the people, appeals to all people of Bengal not to do Strike (Bandh) on 20th September 2012. Check what decision Mamata Banerjee took on 18th September 2012 and think again whether you are with the Strike or against Strike. Does strike really brings out any solution? On & from 17th September 2012 the private bus associations had withdrawn public buses from Kolkata & nearby region on demand of Bus fare hike. People of Kolkata & nearby areas are facing problem reaching their destination from 17th September 2012 because of withdrawing public buses from Kolkata, Howrah, North 24-Pgs & South 24-Pgs. Though, Ministry of Transportation, Govt. of West Bengal has increased the number of Government Buses during this period and Mini-Buses, Taxis are also available; but it's not enough for the people. Today (19th September 2012) Transport Minister of West Bengal, Shri Madan Mitra had a meet with Bus Associations and as a result, Private Bus Associations declares that the private buses will be available from now on. Private Bus Association asked Govt. of West Bengal to either increase private bus fare or to reduce the price of diesel. Bus Associations also declares that they will wait till 30th September 2012, 6pm to see what steps Govt. of West Bengal takes. On 30th September 2012 evening, private bus associations will have a meeting depending on the situation. 2012 Jangipur (Murshidabad) election, vote result of jangipur 2012, congress candidate abhijit mukherjee profile, cpim candidate Mujaffar Hossen profile, Jangipur By-Poll / By-Election / Vote 2012 candidates & other details. 2012 Jangipur Lok Sabha By-Election (Upo Nirvachan) is on 10th October 2012 [Wednesday]. Let's check out every detail like reason of vote, who is the candidate, last year election result etc about 2012 Lok Sabha By-Poll (Election) below. • Details of Jangipur Lok Sabha Kendra: - Jangipur Lok Sabha seat is at Murshidabad district of West Bengal and a Congress has stronghold of Jangipur seat & Murshidabad district also. • Reason of By-Election at Jangipur Lok Sabha Seat in 2012: - Why Lok Sabha Election happening at Jangipur in 2012? This question is obvious to come in our mind. The reason of Jangipur By-Poll in 2012 is newly appointed Indian President Pranab Mukherjee. Because of Indian Presidential Election, Shri Pranab Mukherjee, who won & selected from Jangipur Seat in 2009 Lok Sabha Election, resigned and since then the Jangipur Lok Sabha Seat left vacant. This is why, Election Commission of India has announced the schedule of By-Election (Upo Nirvachan) which will took place to select new candidate for Jangipur Lok Sabha seat. Last date for Filing Candidate Nomination: - 22nd September 2012. Last date for Withdrawal of Nominations: - 26th September 2012. Result of 2012 Jangipur By-Election (Vote): - 13th October 2012. • Candidates for 2012 By-Election of Jangipur Seat: - CPI(M) named 'Comrade Mujaffar Hossen' as CPI(M) Candidate for 2012 Jangipur By-Election. Congress has announced the name of Abhijit Mukhopadhyay who will contest in 2012 Jangipur By-Election as Congress Candidate. • Who is Mujaffar Hossen? Mujaffar Hossen, born in a farmer family, is one of the popular CPI(M) party leader and the CPI(M) State Committee Member from Murshidabad district. CPI(M) candidate Mujaffar Hossen is also the General Secretary of West Bengal Adivasi-O-Lokoshilpi Sansad. CPI(M) canddiate Mujaffar Hossen was defeated in 1996 by Congress leader Adhir Ranjan Chowdhury in the Assembly Election. • Who is Abhijit Mukherjee? Congress candidate Abhijit Mukherjee is the Son of present Indian President & veteran congress politician Shri Pranab Mukherjee. Abhijit Mukherjee is also the sitting MLA of Nalhati Seat where he won last. So, if he wins in 2012 Jangipur By-Election then the Nalhati Seat will left vacant. • Jangipur Lok Sabha Seat Previous Election (Vote) Results: - If we check out the previous Election results of Jangipur seat then we all will agree on one thing 'It's a stronghold of Congress'. Shri Pranab Mukherjee had contested from Jangipur Lok Sabha seat in 2004 & 2009 and both of the times he won. Shri Pranab Mukherjee won by margin of nearly 1 Lakh 25 Thousands votes in 2009 Election from Jangipur Seat. So, the chance of congress winning Jangipur seat in 2012 is higher than CPI(M)'s chance. • Result of 2012 By-Election Jangipur Lok Sabha Seat: - The result of Jangipur By-Poll (Vote) 2012 has announced on 13th October 2012 [Saturday]. 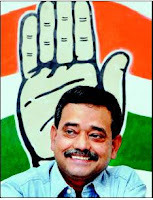 After the counting of 17 rounds, Election Commission has declared Congress Candidate Abhijit Mukherjee as 'Winner of Jangipur By Election 2012'. Indian President Pranab Mukherjee's son Congress candidate Abhijit Mukherjee won by only 2536 votes. CPI(M) candidate Mujaffar Hossen lost by a nominal margin. But it has to be said that BJP surprisingly got around 10% votes. 2012 Purasabha Vote result in West Bengal, 2012 Municipality Poll Vote Election result Pourasabha. The Result of WB Municipality Election (Pourasabha Vote) 2012, which was conducted on 3rd June 2012, has been declared. On 3rd June 2012, the civic poll of six Municipalities of West Bengal happened and today on 5th June 2012 the Pourasabha Election result has been announced. Let’s check out the Six Municipality Election 2012 Result of West Bengal. Total Seat of Nalhati Pourasabha (Municipality) Election 2012 is 15. TMC won 8 seats of Nalhati Purasabha in 2012 Election. CPI(M) won 3 seats of Nalhati Purasabha in 2012 Election. Congress won 3 seats of Nalhati Purasabha in 2012 Election. BJP & Other Party 1 won seats of Nalhati Purasabha in 2012 Election. It means, Trinamool Congress has won the Nalhati Purasabha in 2012 vote. Total Seat of Panskura Pourasabha (Municipality) Election 2012 is 17. TMC won 12 seats of Panskura Purasabha in 2012 Election. CPI(M) won 5 seats of Panskura Purasabha in 2012 Election. Congress won 0 seats of Panskura Purasabha in 2012 Election. BJP & Other Party 0 won seats of Panskura Purasabha in 2012 Election. It means, Trinamool Congress has won Panskura Purasabha (Municipality) in 2012 Poll. Total Seat of Haldia Pourasabha (Municipality) Election 2012 is 26. TMC won 11 seats of Haldia Purasabha in 2012 Election. CPI(M) won 15 seats of Haldia Purasabha in 2012 Election. Congress won 0 seats of Haldia Purasabha in 2012 Election. BJP & Other Party 0 won seats of Haldia Purasabha in 2012 Election. It means, CPIM has won the Haldia Pourasabha (Municipality) Vote in 2012. Total Seat of Coopers Camp Pourasabha (Municipality) Election 2012 is 12. TMC won 1 seats of Coopers Camp Purasabha in 2012 Election. CPI(M) won 0 seats of Coopers Camp Purasabha in 2012 Election. Congress won 11 seats of Coopers Camp Purasabha in 2012 Election. BJP & Other Party 0 won seats of Coopers Camp Purasabha in 2012 Election. It means, Congress has won the Coopers Camp Pourasabha (Municipality) Election in 2012. Total Seat of Durgapur Pourasabha (Municipality) Election 2012 is 43. TMC won 29 seats of Durgapur Purasabha in 2012 Election. CPI(M) won 11 seats of Durgapur Purasabha in 2012 Election. Congress won 1 seats of Durgapur Purasabha in 2012 Election. BJP & Other Party 2 won seats of Durgapur Purasabha in 2012 Election. It means, Trinamool Congress has won the Durgapur Pourasabha (Municipality) Vote in 2012. Total Seat of Dhupguri Pourasabha (Municipality) Election 2012 is 16. TMC won 11 seats of Dhupguri Purasabha in 2012 Election. CPI(M) won 4 seats of Dhupguri Purasabha in 2012 Election. Congress won 0 seats of Dhupguri Purasabha in 2012 Election. BJP & Other Party 1 won seats of Dhupguri Purasabha in 2012 Election. It means, Trinamool Congress has won the Dhupguri Pourasabha (Municipality) Vote in 2012. Overall, the result of WB Municipality Election 2012 shows that people of Bengal are with Trinamool Congress (TMC) and CPI(M) Party is losing their hope of returning in West Bengal Politics. TMC Party has bagged 4 Municipalities amongst 6 Municipality in 2012 WB Pourasabha Vote. Congress party is successfully back at Coopers Camp Municipality and CPI(M) Party only able to retain Haldia Purasabha. It is a memorable day for TMC because of winning Durgapur Purasabha, which was known as home of CITU. Do you want to know the names of Indian Celebrities / Political Leaders / Ministers / renowned Personalities who had died or suffered Helicopter Accidents? Are you looking for the names who had survived the Copter crashes till now? Accident has taken quite a few lives of Indian Ministers & Political Leaders till date and few ministers had survived from helicopter crashes as well. In recent past, India has lost Chief Minister of Andhra Pradesh & Arunachal Pradesh due to Helicopter Crash. Few days back, on 9th May 2012 Jharkhand Chief Minister Arjun Munda suffered injuries & admitted to Hospital in a helicopter accident at Birsa Munda Airport of Ranchi. M Kumarmangalam – M Kumarmangalam was the Central Minister of India died on 30th May 1973 at New Delhi. Sanjay Gandhi – Sanjay Gandhi, one of the emerging Indian politicians from Indira Gandhi family, died on 23rd June 1980 at New Delhi. Madhab Rao Sindhiya – Central Minister of India Madhab Rao Sindhiya was also died for a copter accident happened at Farukhabad (Uttar Pradesh) on 30th September 2001. G.M.C. Balyogi – G.M.C. Balyogi, Loksabha Speaker, died in a Copter Accident at Bhimapur (Andhra Pradesh) on 3rd March 2002. O.P. Jindal – Politician & Businessman O.P. Jindal died on 31st March 2005 at Sahranpur (Uttar Pradesh) because of a copter accident. Rajsekhar Reddy – Andhra Pradesh Chief Minister Y S Rajasekhara Reddy died on 3rd September 2009 at Kurnul (Andhra Pradesh) for the same copter crash reason. Dorji Khandu – Arunachal Pradesh Chief Minister Dorji Khandu died in a copter crash on 30th April 2011 at Itanagar (Arunachal Pradesh). Prithwiraj Chauhan – Central Minister Prithwiraj Chauhan had faced Copter Accident on 16th March 2004 at Khanbhel (Gujarat). Kumari Shailaja - Central Minister Kumari Shailaja had faced Copter Accident on 16th March 2004 at Khanbhel (Gujarat). 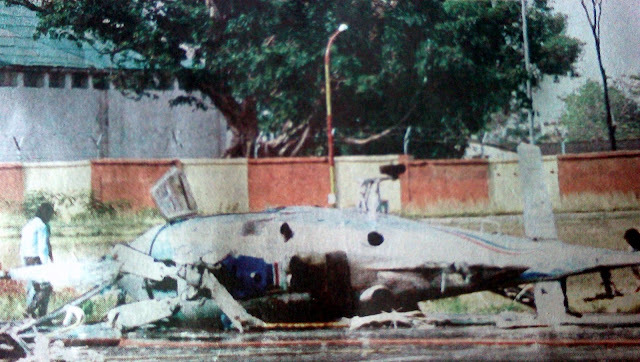 Ahmed Patel – Congress Leader Ahmed Patel had faced Copter Accident on 16th March 2004 at Khanbhel (Gujarat). Amarendra Singh – ex-Chief Minister Amarendra Singh had faced Copter Accident on 12th September 2006 at Gurudaspur (Punjab). Rajnath Singh – BJP Leader Rajnath Singh had faced Copter Accident on 19th May 2008 at Rampur (Uttar Pradesh). Mukhtar Abbas Nakvi – BJP Leader Mukhtar Abbas Nakvi had faced Copter Accident on 19th May 2008 at Rampur (Uttar Pradesh). Arjun Munda – Jharkhand Chief Minister Arjun Munda had faced Copter Accident on 9th May 2012 at Birsa Munda Airport of Ranchi (Jharkhand). West Bengal State Election Commission has announced the schedule of upcoming Municipal Election in six municipalities of West Bengal in June 2012. Municipal Corporation Poll in six Municipalities will be held on 3rd June 2012. Let's check out few detail information about the 3rd June 2012 Municipal Election of Bengal. • Name of the Municipalities where Election will be conducted: - Durgapur Municipal Corporation (DMC), Dhupguri Municipality, Haldia Municipality, Panskura Municipality, Nalhati Municipality and Coopers' Camp pourasabha. • Last date for submission of nominations for the Municipal Election is 7th May 2012. • Last date for Withdrawal of Nominations for Municipal Election is 11th May 2012. More than 590052 voters will cast their votes to elect 129 ward commissioners of these six Municipalities on 3rd June 2012. This civic Municipal Election would be the first major political battle between the ruling TMC party and opposition CPM party after the 2011 Assembly Election change.